Worship is an offering to God! It is both our offering to God and the way that the corporate Body of Christ enters into the presence of God. Thus, worship should involve the mind as well as the heart. Our worship is intended to fill the senses--sight, sound, touch, taste, and smell. By this, our whole being comes into contact with the divine. It is our hope that everyone will experience a profound sense of peace and love in our worship. Through our traditional worship we seek to live in the truth found in ancient wisdom and practices. Here, the beauty of tradition meets a modern faith. We believe that there is only one holy, catholic (universal), and apostolic church. This means that anyone baptized in the name of the Father, the Son, and the Holy Spirit is a Christian and welcome at the table of the Lord. Therefore, any baptized person is welcomed and encouraged to take Communion. Children are as much a part of worship and the Christian community as anyone else. However, we understand the trials of bringing little ones to worship. Relax! God put the wiggle in children—don’t feel you have to suppress it here in God’s house. Sit where you feel most comfortable—near the front to be able to see and hear, or near the rear entrance to the Narthex (foyer). Explain parts of the service. Help children find their place in the bulletin or the service books. If they have a question you can’t answer, have them ask Fr. Chad after the service. Sing the hymns, pray, voice the responses. Children learn quickly! If your child needs to leave the service, please feel free to go with him or her, but please come back! A Nursery and Play Room is available, but not always staffed. Sunday School or Children’s Chapel is available most of the year in the Christian Education Area on the lower level. One of the ushers can direct you if you are not familiar with it. Always remember that the way we welcome children directly affects their experience of faith and the church. This is a church, not a museum! Family gathers here. All may enjoy it! Sunday School begins at 9:00 a.m. starting with the Adult Class, following at 9:30 for children, from September through May. Children attend class during the first portion of the service, then rejoin their parents or loved ones for the Holy Eucharist. We do not have a staffed nursery, but the room is available to those who may need it. Check out the Sunday School page for more information. We gather each Sunday morning at 10:00 AM. Check our News & Events page for special service dates and times! What is our 10:00 Service Like ? Our Sunday service lives into the fullness of the Anglican tradition. This service incorporates hearing God's word in scripture, preaching, Holy Eucharist (Communion), and wonderful music. 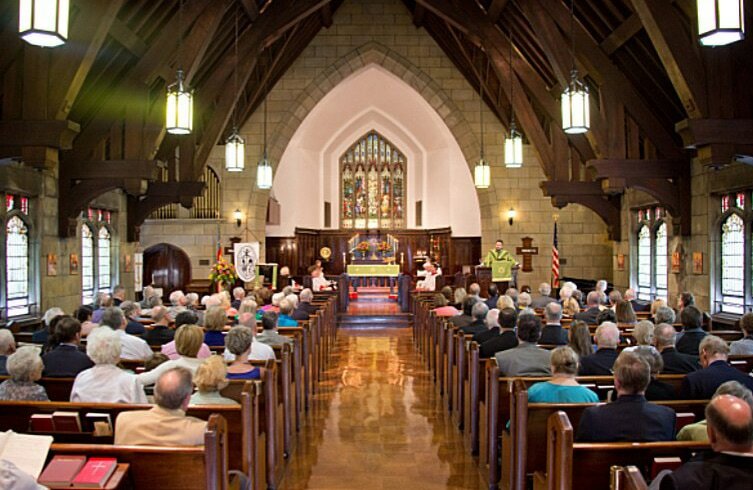 This is our liturgical and spirit-filled service that Christ Church is so well known for and so meaningful to many who are searching for the understanding, love, and healing that comes from having a personal relationship with our Lord and Savior, Jesus Christ.